Errisbeg Lodge is spectacularly set amid private, spacious Wildflower Gardens with little stone-walled fields, and boasts its own private access to Errisbeg Mountain. Depending on the season, flowers which grow here range from Daffodils and Daisies to Fuschia and Wild Thyme, which all blend in wonderfully with the Orchids, The Purple Loosestrife, Thrift and Montbretia that also grow here. 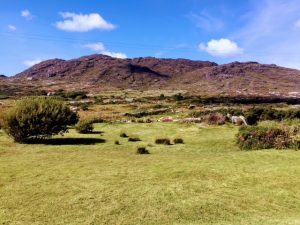 Our Traditional Gardens with 17th Century low Stone Walls and old Cottage Ruins dating from Famine Times – lead directly to Errisbeg Mountain – a gentle climb with panoramic views of Lakes, Beaches, Roundstone Bog, Aran Islands and The 12 Bens Mountains. “I recently visited the wonderful Wildflower Garden at Errisbeg Lodge, near Roundstone. Acres of the most beautiful flowers dotted this land, and in a relatively small space, almost every wildflower which grows in Connemara was thriving. The garden is managed very well; the taller grasses are kept under control using a strimmer, and in other parts, animals are allowed to graze. The rocks are covered in stonecrop and higher up, low gorse and heather form a perfect mat.